Dr. Itai Panas is Professor in Theoretical Chemistry at the Division for Chemical and Biological Engineering.In his research he employs and develops quantum chemical conceptual tools to study a wide variety of systems in the fields of heterogeneous catalysis, and electro-catalysis on nano-particles as well as corrosion, cement chemistry, molecular crystals and superconductors. He has contributed efficient accurate formulations of intermolecular interactions, and strategies to merge density functional theory with wave function based quantum chemistry. 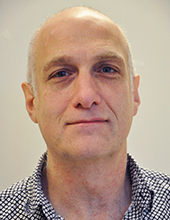 Itai is currently main supervisor for three PhD students.Itai was Swedish Research Council Senior Researcher during 1998-2004. Water Oxidation on MnOx and IrOx: Why Similar Performance? Switching on the Electrocatalytic Ethene Epoxidation on Nanocrystalline RuO(2). Quantum chemical modeling of the reduction of quinones. Theoretical investigation of linalool oxidation. Quantum chemical modelling of the rate determining step for oxygen reduction on quinones. Reaction enthalpies for the hydrolysis of 3p, 4p and early 3d oxide bridges - how unique are the oligophosphates? There might be more projects where Itai Panas participates, but you have to be logged in as a Chalmers employee to see them.